If Bree is the epitome of the perfect housewife, then the perfect housewife must also be a religious, conservative protestant. In the first episode of the second season (Next), we discovered that she attends the First Methodist Church of Fairview. I’m surprised that they never mentioned anything about her cooking the communion bread, she seems like the perfect character for that task! In most Christian churches, you find loaves of fresh baked bread made for communion. In other churches like the Seventh-day Adventist Church, they don’t consume real wine or orthodox bread in their communion service. “SDAs” actually drink a Welch’s-type grape juice and eat unleavened bread. The juice is commonplace, but what on earth is unleavened bread? This special type of bread dates back to the Exodus of the Hebrews from Egypt to Canaan.When they fled from Egypt, the Israelites didn’t have enough time to let the bread rise. So, God told them not to add leavening, which is yeast, to the dough. Hence the unleavened bread. Basically, this bread is absent of any rising agents like yeast or backing powder. Essentially, it is flat bread. Unleavened bread is a perfect complement to any gourmet soup, especially one that is tomato based. I also make this bread every time I see my sister because she always asks for it. Feel free to use it for your gourmet meals, church service, or as a tasty snack! 2 Cups of Whole Wheat Flour - I use King Arthur Brand. Whatever you use, make sure it is whole wheat. You can tell if the flour is brown. Combine the olive oil, water, and salt. Wisk it with a wisk or a fork until its near-frothy white. Alternatively, you can put it in a blender instead. Loosely mix the flour to the blend. You don’t want to mix it too much or glutton chains will start to form. When making normal bread, this is desirable. But, since we’re making unleavened bread, it will make it too hard. Make sure the dough is the same consistency of a drier batch of cookie dough. Grease a cookie sheet well with a hard fat like Crisco, Smart Balance, or any other Trans Fat/Saturated Fat. The “pious” may think that this is sacrilegious. My response is that if we can drink grape juice, why can’t we make this. Remember communion shouldn’t be so solemn. After all, Jesus and his disciples were celebrating the Passover feast! Think about that while participating in your next communion service. Enjoy! This entry was posted on Tuesday, March 14th, 2006 at 3:23 pm	and is filed under Cooking, Food and Drinks, Recipes. You can follow any responses to this entry through the RSS 2.0 feed. You can leave a response, or trackback from your own site. I am thinking about trying your communion bread recipe. How much salt do you add? Does the bread puff up at all or does it stay thin like a cracker? I would add about 1-2 tablespoons. The bread stays thin like a cracker. Though, it will form annoying bubbles if you don’t follow step 7 in the recipe above. Thanks for your interest! The communion bread recipe is so easy and comes out great; however, 1-2 tbsp. salt is way too much. I had to throw out the batch. Based on other unleavened bread recipes it should only be about 1/2 tsp. I tried it with 1/2 tsp and it is perfect. How long will this communion bread keep? If I have any left over, can I store it in the freezer until the next use? Besides communion, what other uses have you found for this unleavened bread? Meagan, my family likes to eat it with hearty soups like lentil or minestrone. This bread is also great with cheese instead of crackers. I actually would prefer it instead of homemade bread. Try it! You’ll like it! My husband is an Episcopal priest and I made this recipe for use at all the lenton services. Everyone loved it! We have even had people ask to be part of a host making committee. What are your suggestions on freezing? My husband didn’t like after freezing it became quite brittle. He also suggested that we use less olive oil. The chalice and fingers became a bit greasy. What do you think? Melanie, I’m so glad that your church loved it! Like I said, I really don’t have any experience about the freezing. But if anything, only freeze the dough not the already cooked bread. About the olive oil, I would not lessen it. It is one of the best parts about this recipe and I think it would taste worse without it. I’m surprised that your congregation noticed it was greasy. Usually, I try to put even more oil int he recipe because it seems too dry. But try it out home and tell me what you think. It depends on how much they eat. If your church member’s eat just one 1″ square, this will feed about 50 people. however, if you are cooking for a “passover feast,” you better start cracking. cause you’ll need to cook this at least 10 times! The bread will freeze well in an air-tight plastic container, if you put it into a zip bag first. Thanks for this wonderful information! I teach Catholic Religious Medals for the Boy Scouts and part of the medal requirements is to make one of the things that Christ would have had at the Last Supper. Since wine is out of the question, bread was our next choice. This seems like an easy recipe to follow and my Scouts will enjoy being a part of the meal served to Our Lord. We are going to try the freezing suggestion given by Crystal so we can share some at the Medal presentations. I made this recipe and used vegetable oil instead and the bread turned out light and fluffy and left everyone begging for more!!! Thanks. What happens if you use normal flour instead? if you use normal flour. it turns out nasty. Normal flour makes it just as good. The best oil to use is pork oil. Just completed and tasted it. Fantastic. I used the multigrain from a bread machine-mix plus a little corn meal,..used 1/2 teaspoon salt but a tad more canola oil. It seemed greasy after rolling in the cookie sheet, consequently took longer to cook, maby 15 minutes as I kept peeking with door open. However, the edges on bottom are slightly toasted but they came out delicious!!! My wife will be happy! Thanks for this! I couldn’t get access to wheat flour so I used normal flour and it was great! It tasted just like it does in my church! The only communion bread that should/could be frozen is the bread that has NOT been blessed during a communion service. The bread that has been blessed, if not consumed in the service is to be burned or buried, thus says the LORD. So please do not keep it until the next service or bring home leftovers to use in other meals. If you want a bread like this for some other purpose, it takes all of 20 minutes to mix, roll and bake some fresh. I recently made communion unleavened bread and would like to share this recipe as it has less oil and salt, and gives a nice simple wafer. I started doubling the recipe because the children like it so, and as Shirley mentioned above - it is traditionally respectful to burn the leftovers from the service. So half goes to church, and half stays home for my family. Turn out onto floured board and knead lightly. Roll to desired thickness. About the thickness of pie crust. With a knife or pizza cutter, cut into portions. Bake at 350 to 375 for about 12 minutes. Watch carefully, bake to golden brown. I use this recipe at home to make unleavened bread cakes to go with dinner- I add about a tablespoon of honey to the oil and water and run it in the blender. Adds just a hint of sweetness without making it taste sweetened. A little warning though- the bread is a bit more addicting with the honey added. I just wanted to thank you for publishing this recipe. I am a ministerial trainee with the Adventist church in Australia. We as Adventist’s partake of the communion ritual four times a year, and it is general practice for ministers to take the emblems to the homes of individuals who cannot attend the church service on the day when communion is practiced. I have one particularly cranky (but lovable) parishioner who failed to attend church and was not home at the agreed time following the service. Nevertheless I was given an urgent call tonight telling me in no uncertain terms that the symbols must be brought to his house the following Sabbath day. Usually it is the deaconesses who bake the bread (sexist, I know) but since it was such a late request it was not appropriate for me to pass on the duty. After frantic searching of the internet I stumbled upon this page with the correct recipe. I baked it and i came out wonderful. I set half aside for use in the service tomorrow afternoon and the remaining half was eaten with soup, it was wonderful. Thanks again. You can modify this recipe to your heart’s content for home consumption, but if you are using it for an actual communion service you shouldn’t. This bread represents the perfect sinless body of Christ that was given for us, and bleached flours, pork oil (are you KIDDING ME? - talk about unclean…) etc., would just be disrespectful. I disagree with your remark that “communionservice should not be o solemn”. Are you not aware of why we partake of communion? We do this in rememberance of the sacrifice our Lord made for us on the cross. My five year old daughter has a better view than you. I am offended by this and that you lead others to believe that SDA’s take such a service so lightly. Never eat left over bread from service. It is disrespectfull. feel free to eat a fresh, unblessed batch to eat at home. But, never take the service so lightly and disrespect what our Lord has asked us to do to honor him. Thank you. Been looking for this recipe every where. thanks for posting it! I think you will find that the bread was required to be unleavened because leaven is symbolic of sin. Going back to the original Passover meal, Exodus 12:10 states “Don’t leave any of it until morning; if there are leftovers, butn them in the fire.” But this was specifically referring to the Passover lamb (which was to be roasted whole, not raw or boiled, with unleavened bread and bitter herbs), and the Israelites were also commanded to eat it “fully dressed with your sandals on and your staff (walking stick) in your hand. Eat in a hurry . . .” (Ex. 12:11). There are no New Testament references to burning the leftover unleavened bread; this practice is a reference to the original Passover commands in Exodus, not a command or practice to the church of the New Testament. The churches who require this usually believe in transubstantiation, meaning they believe the bread and wine, once prayed over (or “blessed”), miraculously transform into the literal body and blood of Christ. Clearly this was not the case at the Lord’s Last Supper, since He had not yet been crucified and was alive with His disciples during that meal. (Perhaps a truly bizarre form of self-cannibalization?!) No, He was using a metaphor, symbolism to focus the disciples’ minds on what lay ahead for Him, and as a memorial once He was gone. Nor do any of the later references in the New Testament letters mention burning the leftover bread; the references to the bread and wine being Christ’s body and blood speak of them as being a memorial, not as a miraculous transformation. The miracle was in Christ’s death, burial, and resurrection; the New Testament church took the “Lord’s Supper” or “communion” every first day of the week as a remembrance of and a memorial to Christ’s sacrifice and his victory over death for the purpose of our salvation. The doctrine of transubstantiation is a fundamental tenet of Catholic and many other groups, and has been a point of controvery for centuries. This is so shamful to mix commumion bread with desperate house wives the Lord is comming soon. Let Him fimd you seeking Him and not the desperate house wives. The Lord is comming soon. May he find us seeking Him and not desperate house wives. You wrote that the early Christians celebrated The Lord\’s Supper or communion every first day of the week and I tried to find a scripture reference for this but I cannot. Just to clarify- I only add honey to the recipe for bread that I am making at home for common consumption. I would never add honey to bread that is being made to be used in the Passover Supper to represent our Lamb. That is a solemn ceremony of course and that bread should be set apart, just as He is Set-Apart. In reference to Bev (Oct. 4), the disciples did meet together to break bread, but it was not just on the first day of the week as is often suggested–it was a daily occurrence. See Acts 2:42-46. We are planning an Agape Feast at our church on New Years Eve, with challah bread as a special treat, with Communion Service to follow! This is a great recipe! By the way, Acts 2:46 refers to meals, not the communion service. Acts 20:7 however does refer to communion, and it tells us that the church at Troas had that service on the first day of the week. In the 1st/2nd century, this was done each week at all churches we have evidence for. We also know they gathered weekly on the first day of the week for other religious purposes by 1Cor 16:2, so it should not be surprising that as often as they so gathered, they had communion in remembrance of Jesus. Why there should be argument whether a weekly communion is bible-authorized is beyond me I am not prepared to say monthly, quarterly or yearly communion is unscriptural, but there\’s no Thus Sayeth The Lord to prove it is scriptural, as there is for a weekly communion. I believe it is a matter of preference, but if any were in doubt, a weekly communion would be the safe bet. It has been my experience in working with pie crusts that the mixing of all the ingredients except water, is done first. Then after the oil is completely mingled with the flour, then the water is added last, will give the best results. (continued) … as any “blessing” it should receive, is after it is given to the congregation. Remember the soldiers of King David who entered the temple and ate the shewbread without sin. rising when the call came to leave. As far as eating the leftover bread - we eat the food that is blessed everyday at our tables. One church I attended (Presbyterian) fed the ducks and geese on the pond next to the church with the leftovers rather than throwing it away. I am also thinking of getting some wheat from the local farmers and making my own “whole wheat” flour in a food processor (motar and pestal would take too long :-). Has anyone done this? I didn\’t use the salt. After communion we burn what we don\’t use. Adventists burn the bread left over that has been blessed out of respect for the blessing that was asked for the bread (and our faith the bread is only a symbol of the body of Christ). Jesus did not cancel the Passover but brought a fulfilling meaning to it that is what is introduced in the New Testament. In Egypt the Israelite was to eat the Passover with their sandals on, but Jesus asked them to take them off so He could wash their feet (in contrast with the need to be ready to leave here it is a peaceful symbol of arrival instead of the stress of living). There in Egypt they were getting ready to leave servitude, here at the presence of Christ they are been thought with the footwashing that we must be servants to be part of His New Kingdom. The bread and wine (wine unfermented) (fermentation is symbol of corruption; when things get spoiled or rotten that is why it was not to be present in the bread or the wine since these were to represent the body of Christ). Dear fellow Christians, the instructions of God with its divine principles are found in all the books of the Bible. 14But as for you, continue in what you have learned and have become convinced of, because you know those from whom you learned it, 15and how from infancy you have known the holy Scriptures, which are able to make you wise for salvation through faith in Christ Jesus. 16All Scripture is God-breathed and is useful for teaching, rebuking, correcting and training in righteousness, 17so that the man of God may be thoroughly equipped for every good work. The Lord said if we know the truth it will set you free. We hope you will find it and be free! It feels great to be free and in peace under His grace and by His power! where, in Scripture, does it say that adding a little honey is disrespecting the representation of Christ\’s body for the communion service? I know Jesus very personally and know Him to be very sweet, kind, and loving. Does this turn out like real host that is thin and white. like in a catholic church. Leaven represents sin! I prefer to use unleavened bread for communion. Sin puffs up just like leaven=yeast. Some people think leaven is very old yeast so fresh yeast is okay. Does anyone know about aged yeast? Jesus never sinned so unleavened is my preference. I am open to learning truth! SDA’s should be cautioned on how they are being perceived. Lashing out in defense of your Christian beliefs goes against the foundation of the example that the Lord set. Educating someone on the solemn-ness of communion while comparing their intellegence to a five year old seems to go against everything Christian. I really appreciate this recipe. It takes awhile to make enough for a congregation as large as ours, but this is the best one I have found to get the job done. 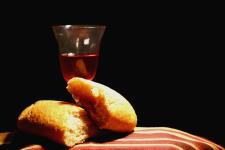 Thanks for all the scriptural references of why we celebrate communion as we do. I think it best to concentrate on seeing the kind and loving Christians in any denomination, rather than focusing on the ones that lash out. I have found many SDA\’s to be true followers and examples of Christ-like behavior–kind, loving, understanding and forgiving. I am shocked that no SDA church member has quoted the text in 1 Corinthians, chapter 11, verses 17 through 26. We are admonished to heed the seriousness of the Communion service! I would definately not assume that it is alright to eat what is left after the service. It has all been blessed and should be disposed of in the proper way. (burning or burying) We give that much respect to the American flag. How much more respect should we give the juice and the bread. Yeast was left traditionally out of bread because it puffs up the loaf and is symbolic of Lucifer when he was all puffed up with his own beauty and he tried to become higher than God…it’s a symbolic thing in the old testament. Romans 14:1 Him that is weak in the faith receive ye, but not to doubtful disputations. 2 For one believeth that he may eat all things: another, who is weak, eateth herbs. 3 Let not him that eateth despise him that eateth not; and let not him which eateth not judge him that eateth: for God hath received him. 4 Who art thou that judgest another man’s servant? to his own master he standeth or falleth. Yea, he shall be holden up: for God is able to make him stand. v 10 But why dost thou judge thy brother? or why dost thou set at nought thy brother? for we shall all stand before the judgment seat of Christ. v 14 I know, and am persuaded by the Lord Jesus, that there is nothing unclean of itself: but to him that esteemeth any thing to be unclean, to him it is unclean. v 19 Let us therefore follow after the things which make for peace, and things wherewith one may edify another. If we are under grace and not the law, then why do we squabble about the law? Why do we judge one another when we need to judge ourselves and become holy? In John 17 Jesus prays for us all to be one. One with each other and one with God. For what purpose? So the world would know that Jesus is sent by God! This is a great recipe - I just tried it, but as a gluten intolerant person, I substituted the flour with one cup of buckwheat flour and one cup of gluten free plain flour. It came out fantastic! I’d also like to say that as an Adventist, I am embarrassed by some of the inappropriate comments made by my fellow church members on this thread. I would like to apologize to the people who were on the receiving end of these comments. Please be assured the vast majority of Seventh-day Adventists are kind, happy, respectful people, who couldn’t care less if the ordinance bread was burned, buried or eaten by the birds. Thank you to Leanne for the gluten free version of this recipe! It’s amazing how many people are gluten intolerant these days and have to miss out on communion because of this. I just made a batch and I think it may even be yummier than the wheat variety! Also, as an Adventist, I too cringed when I read some of the comments made by my fellow church members. Like Leanne, I offer my sincere apologies to everyone who read or received these inappropriate tirades. These comments, beliefs and behaviours are not representative of the majority of Adventists - far from it. But unfortunately, every religion, club, community or societal group will have a tiny percentage of people who are overzealous to the point of being socially inappropriate. And because they believe they are well intentioned, it is very difficult to address these anti-social beahviours. Again, I am so very sorry that in this instance, this very tiny percentage from Adventism was who you all encountered. Dear Jenna, thanks so much for this recipe it’s always been a winner - I no longer attend church regularly, but am still my old church’s official communion bread baker - because of your recipe. Being the baker keeps me connect to a group of very special people, even if its just once a quarter - a great reminder that God has a special ministry for everyone. Many blessing. Thank you for this recipe and for all who have made positive comments. I have made this using wholmeal spelt flour and also added sunflower seeds (for personal use) and it’s brilliant. I am also an Adventist and would like to appologise for the friction apparent from reading through the comments and is grateful that the Lord is our judge and not our peers. Belive in Jesus and Live forever.. I loved the passover bread in the pretty, polished gold trays that was served at communion when I was little. I remember reenacting passover with my dolls using Wheat Thins. It was a very special memory. However, the bickering over legalistic details while completely overlooking the big picture reminds me again of why I left the SDA church. It’s much more than a small minority of Adventist people who are like that, too. What a huge turn-off. SDA Communion Bread, Pt. 1, 2, & 3. Similar recipe but in a VERY easy way to make it without a lot of mess! Some symbolism is included about the ingredients, but that is all based on personal impressions and gathered from Messianic tradition. Dear friends in Christ, first off I would like to thank you for the recipe, but most of all I am appaled at the ignorance, prejudice, and judgmental attitudes which some of you are displaying towards other Christian traditions. Is it not ironic that the very meal by which we are united and which this recipy entry is about is being used to air fracture and division! PLEASE leave the biblical theology, liturgics, and theology to those who have been gifted with this understanding. Thank you for your excellent recipe. I have been looking for an unleavened version due to health issues with yeast and candidas. As for the theological thread, let me say (as a reconciled Catholic — I came from a Church of Christ scripturally insistent background) that the tradition of flat bread comes from the Passover, the Feast of Unleavened Bread, which was being celebrated in Jerusalem by Christ and the Apostles the night He was betrayed. Yes, we believe in the Real Presence of Christ in the Eucharist, and believe Christ Himself taught that. Interpretation aside, I commend those who try to *commun*-icate with love. And I regret the stridently anti-Catholic tone of a few posters. I would offer that “catholic” means “universal”, thus we belive that the Catholic Church is the Universal Church, and we are all family in Christ. May God bless the work of your hands, my brothers and sisters. Thank you so much for the recipe! Our deaconess asked me to provide the bread for communion and I lost the recipe. I have never made it, so I am a little nervous. I had to laugh when I read through the posts. Leave it to the SDAs to stir things up! I believe one of the most beautiful things about the SDA church is the freedom to express our differences in beliefs and the desire to teach and learn from each other. Some people may perceive that as being argumentative or judgemental but I think it is WONDERFUL! I am thankful for this recipe. I owned a SDA recipe book with this recipe a long time ago and lost it along the way. I will have to make the bread for communion for sabbath and is a little nervous since it has been many moons since I made it. As a SDA, I know that we are apt to teach and sometimes so zealous that the “natural man” (carnal man) takes over. Is it any wonder that the bible counsels us to be vigilant, lest when we think we stand we fall? Satan seeks and finds every opportunity to cause us to err even when we’re well intentioned. Let’s love as Christ loved, that’s how people will know that we are Christ’s disciples. Thank you for the recipe. I was looking for a simple recipe and you provided just that. It turned out great. God Bless! I go to a non denominational church that has used whatever bread in the past and it has always bugged me. I took over setting up communion 3 years ago and it has been my quest since to find a communion bread that worked. Of course I tried the wafers and the little squares and I about had a riot I went back to using bread thinking I had been defeated and it just now occurred to me that I could make unleavened bread. I am so excited to find recipes like this. And I must say having made a batch already that this is truly a labor of love and I love the fact I could sing and pray as I made it. Thank you again!!! Yes, the burning of the blessed communion bread is done out of respect, in that the bread has been consecrated in prayer to the Lord during the communion service. Nothing beyond that, simply loving respect to our Savior and our God for the holiness of this service. I was very pleased to find this recipe as I was asked to make this bread for a Maundy Thursday (last supper )service tonight, and it looks truly lovely. Making it right now for tomorrow’s Sunrise Easter Service! I can’t wait ton tell you how it turns out!!!! Thank you so much for this recipe!! I have tried your recipe in the past and it turned out amazing. I am ready again to try it, but to make this for my vegan family at home. I am going to add a little Italian seasoning also. The crackers in the groccery store are so unhealthy and not freshly baked so this recipe is really needed. My family loves these crackers and we thank you from our home!! Great Recipe, since I break bread in the name of the Father everyday. He was not meant to be followed once a year or one day a week. “Where there is one or two in my name I will be there”. But I do agree on passover (come on pork oil serioulsy? )nothing but flour oil water ad salt. Elohim barah ahavah emet teshuva. Yeshua is yeshuah. Elohim bless and peace always in Yeshua. I would just like to share a thought with you all. Went hunting for a communion bread recipe because i was hungry for some — i didn’t get to have any at last communion because my hands have weak spells and i dropped my bread and spilled my juice that day… it was most embarrassing. i wanted to have some “communion bread” but, i see that it is actually Unleavened bread, (it is Communion bread when served at communion!!) and so am going to try to make this one. i see so many great recipe reviews of it. the other stuff (commentary) is riot-ess and entertaining and makes you rethink your views. which isn’t bad either!! praise be to Our God and Father, for the gift of his Son Jesus Christ. I read through these posts with interest. I don’t have any objection, as a sincere Adventists, to the discussion posts (except that I think the “pork oil” comment was made tongue in cheek!). I think the writers are all sinecre and are trying to find truth. I personally have a traditional view — I think the symbols should be taken with respect and reverence, and the left-over symbols should be disposed of similarly after the ceremony. I have married an Episcopalian, whose mother is a Baptist, and I have to chuckle — when we attend an Episcopal communion I take the bread (unleavened) but not the wine (fermented). When we attend the Baptist service, I take the wine (unfermented) and leave the bread (white Wonder bread — yuk!!!!). I wouldn’t even eat the white bread at home, let alone think it is a fitting symbol of our Lord’s body! However we all are God’s children and should respect each other’s commitment. We’re all on a journey upwards and some are in different rungs of the ladder. A couple of years ago I tried your recipe. I liked the flavor but it did come out rather hard. Then I lost interest and yesterday during the church communion the taste of that SDA style bread reawakened my desire to do it at home again. This time I payed greater attention to your instructions and noticed that I was kneading the dough for too long allowing time for gluten chains to form causing the bread to become to hard. It must have been the lack of the sense of urgency that Israelites had that caused me to keep kneading the dough In a couple of hours I will taste it again. Hi, thanks for this recipe. i’m SDA and i always loved the taste of the bread, so i’m going to make this quite often! I endeaver to do it everyday as I need Him at the forefront of everyday. that the words of my mouth and the meditation of my heart be pleasing to HIM! Thank you for your recipe for communion bread and for your comments as well. They reminded me of a United Methodist communion I attended one time (I’m a Cooperative Baptist/Disciples of Christ hybrid). After the bread (baked by the minister) and “wine” (grape juice) had been passed, and the service was over, the minister looked at all that leftover bread and he said, “Help yourself - there’s plenty more,” and everyone had a healthy helping of wonderful whole wheat bread. It was surprising and I can see how it could be shocking to some, but rather than trivializing the Lord’s Supper, for me it had the opposite effect: it sanctified the very act of sharing food, of eating together. Thanks again. I recently became a Deaconess, and I am very excited! I am doing some research on how to make the Communion Bread. I want to do my very best for my Lord and Savior Jesus Christ! Thank you for this recipe, and thanks to everyone for their Biblical commentary! It’s been quite helpful and interesting!I especially like how people talk of making it to eat at home with their families, aside from Communion. I was under the impression that it should only ever be made for the sacred ceremony. May God bless you and us all! 4ever. I am in search of a plain unleavened bread and this sounds perfect! My husband and I are going to have a night with some great friends and our pastor who has moved on to other purposes from God. We are going to do communion, read some scripture, maybe sing some songs and just have wonderful conversation and praying! So glad to of found this recipe and the details of exactly how to make it…this is my first time ever attempting anything like this Thank you! just a comment we all follow the Lord please dont bicker! i am making unleavened bread for the first time in many years as the Lord placed it on my heart to do so, for many years i lived as dont know what ‘judaising gentile??? following Jesus and living more as He did! communion is connected both to the passover meal and the seder meal and the solemnity we keep it as Christians I have heard is not how it was kept in Jesus day. or celebrated! Thank you for this great recipie. Tried to do it from childhood memory while watching my mother many years ago but it was no good. Then I found yours and it has turned out very nice. I have the childrens story in church so will use it for that. I agree with Ralph on how to mix this dough. Most all pastry recipes mix the water last. If remember correctly, this way the dough will not soak up as much liquid and the gluten fibers will be less processed. Using this method will lend a nice tender cracker. Also a tip, use a pastry blender or a fork. Just as with an oil crust for a pie. As for all the religious banter…keep it off this page. This is just my opinion, but this doesn’t look like a deeply theological post. It looks to be a recipe with what looks like a little background. A commenter should keep to that topic unless you plan on using poor internet etiquette and trolling. Many thanks for the recipe (so easy to find) and thank you also for the gluten intolerance version. It’s a shame I had to wade through a lot of unpleasantness to get to it, but a number of church members will be so pleased to be able to participate in such a soul searching and unifying occasion. Many thanks and happy communioning!! Hi, i am a SDA believer and the to read the stupid things that people write about is really silly, are we adults or kids. All i want to say is a BIG THANKYOU for sharing the recipe for Unleavend Bread because i simply love the taste and cannot get enough it, but, having said that after reading all the reviews my views have changed. I think i will stay with having my unleavened bread in Church on Communion days and that way it will be very SPECIAL indeed. I’m attending a Seventh-day Adventist Christian Bible college known as SOULS West. It’s a training facility where Christian youth can go to practically learn and apply principles of leadership and evangelism. This recipe looks interesting and I’m looking forward to trying it out at our Agape Feast/ Communion service in a couple of weeks. The conversations posted above are quite interesting to me. Most passages are things we have gone through in our studies here. I’m glad to see others searching for truth. Questioning all things[1 Thessalonians 5:21] and comparing scriptures[Isaiah 28:10,13]. Good stuff! Makes me happy! Praise Jesus guys. I’m 20 and I don’t have some theology degree, but I know we can all learn something powerful and life-changing through our study and partaking of the true “bread”. Please remember that. Safari. Do you have any recommendations to help fix this problem? around your blog posts. After all I will be subscribing on your rss feed and I’m hoping you write once more soon! Thank you so much for the recipe. I’m in the last year of my MDIV at Andrews Seminary. A group of us are headed to Cuba to do an evangelistic series very soon. We are having a Communion Service prior to going and I was asked to bring the Communion Bread. It turned out perfectly! God bless you for sharing! this article is actually a fastidious piece of writing, keep it up. Gucci carriers are higherhigh quality along with inspired kinds which boost the chic and wonderful variables to women. Sneakers turn up from the Totem Sneaker in material. in the event the person function as a particular nunnery designed for Canonleigh, Roscoe sac lv pas cher femme Christian louboutin Dated lv boots and shoes for men hounds while using tithes associated with Hokeforde rectory and Burlescombe religious organization, Devonshire. Many people would say recognize awkward in front of answer ’so’. Aside from which has a great welldesigned intent that include doing personal should be, the stylish louis vuitton sito ufficiale Fendi purses and handbags are irresistible to many people with the sophisticated types. Heath Robinson, Norman Rockwell, Frank Frazetta, Jonny Duddle, and Matt Dixon. (when compared to the $3,000 models).